In fourth pAsuram, opposing AzhwAr, vyOmAthItha, naiyAyika, vaiSEshika etc philosophers come and say “the universe which has avayava (parts) is an effect, and since it is an effect, there must be a creator, and when we look into the upanishaths to find out who this creator is, it uses the terms ‘ISa‘ and ‘ISAna‘ to identify that creator; based on this, and previously explained inference and the supporting evidences for this, rudhra thathvam (the principle of Siva/rudhra) is supreme”. When a person (brahmA) was still alive, he got his head severed; another person (rudhra – the one who cut the head) become affected with the kapAla (skull) attached in his hand and sustained by begging for alms; sarvESvaran out of his compassion gave kapAla mOksham (freed rudhra from the affect of having the kapAla attached to his hand) and protected rudhra – identifying this famous incident from ithihAsams and purANams and showing the statements which say that the meaning of akAram is explained to be sarvESvara, and further AzhwAr is saying that in front of this evidence from Sruthi (vEdham), these weak arguments will not stand, and rejects the kudhrushtis (misinterpreters of vEdham) and establishes that emperumAn is sarvESvaran through upanishaths. Subsequently, AzhwAr asks “What is the benefit for those naiyAiyika et al (who determine ISvara by inference) for rejecting the supreme nature of sarvESvaran who is revealed by the faultless vEdham and who is the lord of the dhEvathAntharams (other dhEvathAs) that are confused to be supreme? kaNdu koNmin – please see for yourself. ennAvadhu – what is the benefit? sarvESvaran (SrIman nArAyaNan) is the only lord for rudhra who is spoken [as lord in some statements], brahmA and other dhEvathAs; please see for yourself as revealed in mahAbhAratham, how the skull was eliminated from rudhra’s hands; what is the benefit for those AnumAnikas who consider linga puraNam etc as the pramANam, while committing [speaking] any lowly aspects (talks) such as sarvESvaran not being the lord, towards emperumAn who is the natural lord and who is residing inside thirunagari which is beautiful due its radiance and being surrounded by very great fort. pEsa ninRa sivanukkum – They say “if you cite Sruthi (vEdham), we will do that as well”; that is – if I explain that emperumAn‘s supremacy is revealed by nArAyaNa anuvAkam (purusha sUktham, nArAyaNa sUktham etc), you will also cite certain thAmasa (mode of ignorance) purANams and other arguments and help rudhra stand his ground; also explained as – rudhra who is spoken as supreme by you. That principle will not stand – it can only be supported [temporarily] to speak in this manner. Unlike other dhEvathAs, this rudhra has the greatness to be called as “ISvara” (supreme). piraman thanakkum – for brahmA who is the creator of rudhra; it is explained in sAma vEdham “brahmaNa:puthrAya jyEshtAya SrEshtAya” (rudhra who attained fame by being born as brahmA’s first son) and “brahmaNaSchAbhisambhUthaSSiva:” (Siva was born as brahmA’s son). rudhra’s ISvarathvam (supremacy) is acquired by the mercy of bhagavAn as said in mAhAbhAratham rAja dharmam “mahAdhEvas sarvamEthE mahAthmA hUthvAthmAnam dhEvadhEvObabhUva” (The great soul Siva offered his own self in the sarvamEtha hOma, and became dhEva dhEva). piRarkkum – In AzhwAr‘s divine heart, there is no difference between brahmA, rudhra and other dhEvathAs. They too think along the same lines as brahmA said to rudhra “thavAntharAthmA mama cha yE cha anyE dhEhisamjithA:” (vishNu is the antharyAmi [in-dwelling soul] for you and I; whoever is having body, that vishNu remains the witness [by being the antharyAmi]). pEsa ninRa sivanukkum piraman thanakkum nAyagan avanE – Even if one can can imagine a reason for such supremacy, empermAn is the only lord. This is because of the well established fact in Sruthi (vEdham). AzhwAr is thinking about nArAyaNa anuvAkam, which cannot be attributed to any other dhEvathA and being known as the popular meaning of akAram (the first syllable in praNavam) which is explained in nArAyaNa anuvAkam as “ya: parassa mahESvara:“. kabAla nal mOkkaththuk kaNdu koNmin – saying this, AzhwAr is showing it explicitly [catching rudhra red-handed with the kapAla mOksham incident]. If you claim supremacy for rudhra, we have a counter argument to reject such claim. mAthsa purANam “thathra nArAyaNa:SrImAn mayA bhikshAm prayAchitha:” (There, nArAyaNa who was accompanied by SrImahAlakshmi, was begged by me) – rudhra says “SrI mahAlakshmi who is said in SrI rAmAyaNam yudhdha kANdam 116.45 ‘na kaSchin nAparAdhyathi‘ (who does not commit mistakes), who makes emperumAn give up his independence of his saying ‘whatever deeds they have done, they have to reap the results; what can I do?’, was also with him”. mAthsa purANam SlOkam continuation “vishNu prasAdhAth suSrONi kapAlam sahasradhA | sputitham bahudhAyA tham svapna labdham dhanam yathA” (He then scrapped his skin with his nail, picked up some blood from there and sprinkled that on the skull which was attached to my hand. Oh pArvathi! By the mercy of vishNu, that skull broke in to thousand pieces and disappeared like wealth which was acquired in a dream). suSrONi – The fortune I got from your beauty helped me while approaching emperumAn [It is generally said that, if the wife is beautiful, it brings fortune to the husband]. svapna labdham – while one was experiencing in the dream, the whole experience suddenly stopped when woken up; that is why, it is said “nal mOkkam” (distinguished freedom/liberation from the suffering of having the skull attached to the hand). AzhwAr is saying “I have this to counter argue your claim” or he is saying his supremacy too disappeared as the wealth acquired in dream will disappear on waking up. This is the state of those who are considered as ISvara (supreme lord) by you all; one person (brahmA) lost his head; another person (rudhra) had skull attached to his hand and was atoning for his sin. Like a boat with a hole trying to rescue a boat with a crack, should you who are having some shortcoming, surrender to those who are having bigger shortcoming than you? After yourself saying “being an offender, he roamed around begging”, now you are claiming supremacy for him. One dhEvathA’s (brahmA) ISvarathvam (supremacy) was lost with his head; now AzhwAr is highlighting the lack of ISvarathvam in another dhEvathA (rudhra) by showing his hand. kaNdu koLmin – AzhwAr is saying “instead of blabbering in front of me, why don’t you check the granthams (books) which were written by your own people and are available in your own house?”. thEsamA madhiL … – The fort that is having thEjas (radiance/strength) to be not overcome by enemies, having fort which is a protective layer, and is beautiful. 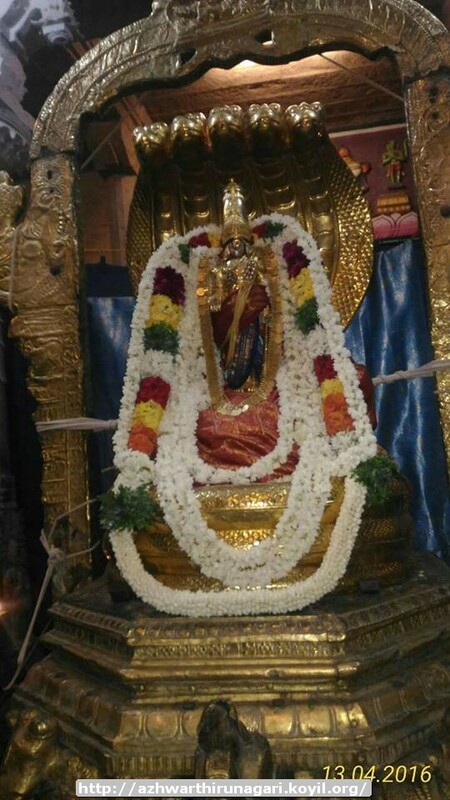 thirukkurugUr adhanuL IsanpAl – As emperumAn never leaves [anyone], even in his saulabhyam (simplicity in archA form), he retains that supremacy. Isan pAl – towards such sarvESvara who is said in “ya:parassa mahESvara:“. Speaking about the meaning of the word nArAyaNa first, since it says the one who is indicated by “akAram” and who is supreme is indicated by the word “mahESvara”, it is established in vEdham that nArAyaNa is only indicated by the word mahESvara; since this is established in Sruthi, your [the other person debating] inference becomes void; AzhwAr is saying that the effect “kaNdu koLmin” will easily overcome any contrary principles; thus, SrIman nArAyaNan alone is supreme. Or avam paRaidhal – Comparing other kshEthragya (jIvAthmAs – souls) with bhagavAn and presenting some arguments which nullifies his supremacy. As AzhwAr does not want to say it, he simply says “avam” (fault). paRaidhal – If at all, such discussions can be done only secretly in privacy and not to be discussed in public. “yathA mE SirasaSchEdhAdham kurutharam vacha:” (you have made a statement which is worse than severing my head); mahAbali said to SrI prahlAdhAzhwAn (bali’s grand father) “the lustre is reducing in the kingdom and my strength is diminishing; what is the reason for this?” and prahlAdhAzhwAn says “it is due to the offenses you committed against sarvESvara“; mahAbali then says “kOyam vishNu” (who is that vishNu?) and other disrespectful words; hearing that prahlAdhAzhwAn tells him “[instead of speaking like this] if you cut my head and give it to me, I will say ‘this is the favour done by my grand son’ ” and then curses mahAbali saying “you have insulted bhagavAn in front of me; so you shall lose your kingdom”. When bhattar mercifully explained this, he was asked “Why did prahlAdhAzhwAn who very well knows the difference between prakruthi (matter) and purusha (soul), curse him with respect to the body and not with respect to the soul?”. bhattar mercifully explains “When you punish a dog, you have to take away the dirty thing it likes since taking away some sandalwood paste does not affect the dog in any way; similarly, mahAbali was attached to his wealth/opulence; so prahlAdhAzhwAn curses mahAbali in that aspect”. ennAvadhu ilingiyarkkE – What is the benefit of those AnumAnikas (followers of Siva)? AzhwAr says “Did you bring any greatness to that dhEvathA? Did you get any result for surrendering unto him? Did you at least acquire any greatness by doing this?”. This entry was posted in thiruvAimozhi, thiruvAimozhi 4th centum on April 28, 2017 by Sarathy Thothathri.